If you have only one missing tooth then a single-tooth implant is an ideal solution for your smile. It’s a great alternative to a bridge as it restores the gap without sacrificing any of your neighbouring healthy teeth. A small titanium post is positioned into the jaw to replace the missing tooth root. Once the implant has fused with the remaining bone tissue it should be strong enough to support the replacement crown. Your crown will be designed to match the surrounding teeth for an extremely natural result. With the proper care of an implant, patients can expect years of comfort and functionality. Implant retained bridges can be used when more than one tooth is missing. 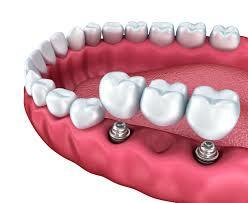 They are very similar to a traditional dental bridges but are supported by implants instead of natural teeth. In doing so they have many advantages. For a free consultation or if you require further information regarding implants please call the Practice in order to make an appointment to see Mr McLean.